Taking viewers on a ride through the Cairo Metro, filmmaker Melody Patry employs an unconventional style to create a documentary that shows Egyptian artists as they respond to the issue of sexual harassment. 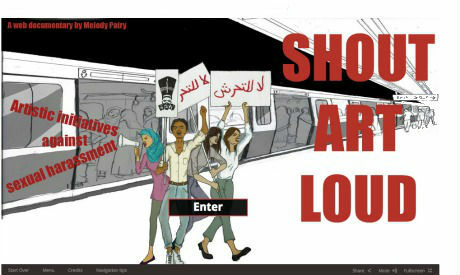 Shout Art Loud - which is available for viewing online at Index on Censorship, the website for an international organisation defending free expression - uses the Cairo Metro as the backbone of the film. Viewers can either take the journey the filmmaker put together or do their own stops, choosing between the different metro stations. Each station offers one or a few stories, with every stop characterised by a specific art genre through which sexual harassment is addressed. The film also has two additional chapters - or rather metro stops – one of them explores art on protesters' placards while the other looks at taboos and censorship. The closing chapter suggests that we revisit our perceptions. "I wanted the documentary to be accessible to an audience that was not necessarily [well-informed about] sexual harassment in Egypt. You do not have to be an expert in women's rights in the Middle East to go through the web documentary," the filmmaker Melody Patry told Ahram Online. "The fact that Shout Art Loud is available online is all the more relevant today, as more artists use the internet as a platform to share their work." Patry is focused on art as a means to bring about change. She believes it is art that has the ability to trigger debate and inspire change in a society, especially when traditional forms of advocacy become powerless and insufficient. "Art engages with people at various levels and transcends gender, religious, cultural and sociopolitical barriers," Patry says. "In the documentary, Merna Thomas explains that if you see graffiti in the street for example, whether you agree or disagree with it, it creates some form of dialogue, of interaction with passersby. Sexual harassment remains a sensitive topic and artists have played a major role in pushing the debate into the public space and inspiring social change." The artists featured in the documentary are among the most prominent working within the realm of sexual harassment. Although groups and artists such as Graffiti Hareemy initiative, the Bussy Project monologues, and rapper Maryam Mahmoud have been featured in documentaries and foreign media reports on sexual harassment, it may have been more suitable for a documentary with such an impressive and creative form to present artists who might be working on grassroots movements that have less of a media presence. "The art scene is thriving in Egypt and many artistic initiatives addressing sexual harassment and violence against women are taking place. Women's rights groups are also using artistic tools in the context of gender and feminism," Patry told Ahram Online. "I was lucky to be able to film and present some of these initiatives, but Shout Art Loud is not an exhaustive list. I am following the developments in Egypt closely and hope to be able to update the documentary with new projects and complementary interviews on a regular basis." One of the interesting – and perhaps underreported projects – featured in Shout Art Loud is the theatrical performance, Maknoun which was done in November 2012 as a collaboration between Studio 15/3 and Heya Foundation for Women. The workshop included 20 young men and women who shared stories on sexual harassment and came up with sketches for a final performance. One of the sketches highlighted in the documentary portrays a harassed woman denying that she has been harassed. The actors excel in bringing to life the inner conflict between being hurt and wanting to hide the shame of being a socially pressured woman. The film highlights two dance initiatives that deal with sexual harassment: one is a flashmob organised in Heliopolis (performed earlier this year) where around 40-50 women gathered to make a public statement in the upper-middle class neighborhood; the other is a video art project called Cairography (late 2012) in which contemporary dancers explore the limits of their bodies on Cairo's streets. On the other hand the taboos and censorship chapter provides a much more interesting view. Dancer and actress Nadine Emile shares her story on the censorship authority removing one of her stories from the Bussy Monologues in 2010. The story, told in English, is about a girl being sexually molested by her cousin. Emile eventually performed the text without using words, but only miming it so the audience would know they have been censored. Emile tells the story in the film, and the director uses inserts from the performance which brings the viewer closer to the story. All in all, Shout Art Loud presents an interesting format, topic and user engagement. However it would benefit from additional research and deeper analysis of the issues it tackles not to mention stronger fact-checking to present a clearer image of the issue at hand.